The ninth episode starts with Seul-Bi leaving with Sunbae but she stops and changes her mind and gives back the book and decides to be human. Seul-Bi then goes to Woo-Hyun crying and starts hitting him and tells him to cry and he does and she holds him. They go home together and she tells him she will stay and holds his hand while he sleeps. At school the gym teacher finds the homeroom teacher resignation letter and he lies to the principal that he needs a leave of absence and she then makes the gym teacher the homeroom teacher temporarily. Sung-Yeol doesn’t come to school along with Woo-Hyun and Seul-Bi and he feels upset because his mother is getting remarried. Jae-Suk is beating up Chun-Shik again and he says that he is going to tell that Seul-Bi didn’t steal his phone. Sung-Yeol finds Seul-Bi at the restaurant and helps her clean the tables with her and she tells him that she isn’t leaving and that she has no adults to tell and it reminds him of himself. Mrs.Ahn finds Sung-Yeol and asks why he wasn’t at school and he won’t tell her and tells her to do nothing for him and not act like his mom. Seul-Bi tries to bring Woo-Hyun food and he flings it from her hands onto the floor. Seul-Bi then tells him that she will tell grandmother what he wanted to say and then she runs to the hospital. She finds Sunbae there and he wants to ignore her but she asks him for a favor and he says he can’t do it and so she settles with having him tell grandmother that Woo-Hyun loves her and that she will be happy as long as Woo-Hyun is happy and Sunbae is angry. Sung-Yeol saw her go the hospital and asks her who she was talking too and she says nobody. Woo-Hyun is at home and tries finding Seul-Bi and starts panicking and then finds her in the restaurant and he tells her he was worried she left without telling him. The next day Seul-Bi gets an order from the restaurant and the weird guy with the ice cream from before comes in and congratulates her on becoming human. He tells her that he was once an angel and now he is the chairman of the human angel committee. He gives her his number and tells her they have meetings and that she should never tell others she is an angel. Sung-Yeol comes and they talk about parents and tells him that he should be grateful that he has them and can see them whenever. They decide to do some cooking for the restaurant and he puts on the apron for her and remembers when Woo-Hyun did it for her. He helps her cook because he taste weird and they make them and send them on delivery. They do the dishes together and touch the same plate and then drop it. Some men come in screaming for Woo-Hyun’s dad and that he took out a loan on the restaurant. They go into their house and make a mess and get violent and Seul-Bi bites his hand. They all end up at the police station with Sung-Yeol’s dad the loan agreement interest rate is illegal. 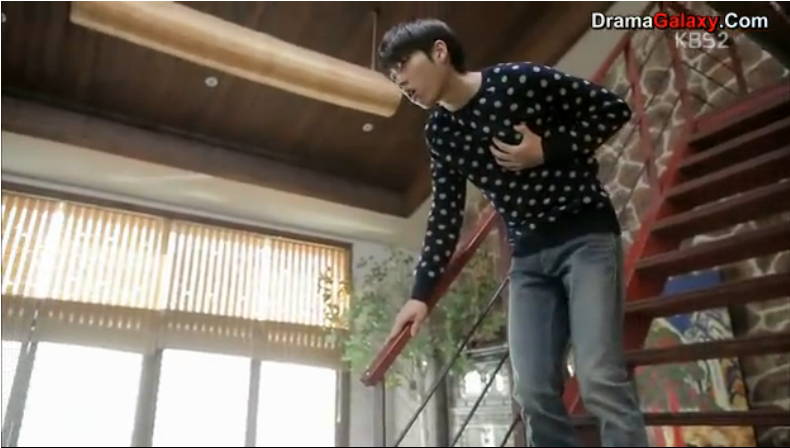 Sung-Yeol is told to take Woo-Hyun home and they leave. Mrs. Ahn is told by her husband about Woo-Hyun’s situation and that they can’t find his dad and that he will probably lose the house and restaurant and that he should look for his mom as well. Mrs. Ahn makes a bunch of food and puts it in the fridge for Sung-Yeol to take to Woo-Hyun. Woo-Hyun tries phoning his dad but their is no answer. The next morning Seul-Bi asks Ki-Soo to help her find a job so she works a couple of jobs but gets fired from them all. Sung-Yeol’s dad comes and talks to Woo-Hyun and tells him he is looking for his dad and asks if he should look for his mom and Woo-Hyun tells him no that it will make things worse. Seul-Bi is going home and Sun-Yeol finds her and sees that she bought medicated patches from working so hard. Woo-Hyun tells Seul-Bi to not do anything because it won’t help to work because she can’t find his dad or pay back the loan. The next morning Sung-Yeol packs up the food and takes it to Woo-Hyun. Seul-Bi does some more work and finds a flyer for a lost dog with a reward and she finds the dog and gets hurt from some boxes falling on her. Sung-Yeol gets mad at Woo-Hyun for acting so childish and being the sorriest person and tells him that he should stay away from Seul-Bi because he feels bad she is working so hard for him. Seul-Bi gets the reward money and goes home and finds the loan sharks there and gives them the money and they laugh at the amount. She says she will pay it back and will work and one of them makes a comment that she could make money other ways because she is pretty and Woo-Hyun stops them. They dump out the money and Seul-Bi picks it all up. Woo-Hyun gets mad at Seul-Bi for wanting to pay the loan and they fight and he pushes her down and tells him that she gave up everything to stay with him and to stop acting like this. He tells her to go and then a flowerpot is picked up and put over his head invisibly and she pushes him out of the way and this is how the ninth episode ends. So finally we get to see the ninth episode! Wow the sadness continues from the previous episode! Poor Woo-Hyun but yet his behavior is becoming too much towards the end to Seul-Bi. Although I am a little confused with Sung-Yeol’s and Woo-Hyun’s relationship like were they friends before or did they only met recently and now are friends because of Seul-BI’s influence? I am not sure why Sung-Yeol doesn’t think that his parents do not love him I mean his dad seems awesome! His mom may not be great but his dad seems to be a good dad but he may just be angry because he got remarried. How could his dad take out a mortgage on someone else’s property without their consent that does not seem to make sense? I thought that Grandmother was selling the shop? I guess she died before she sold it? I mean Woo-Hyun has the money from his mom so he could go live somewhere else with the money because he really couldn’t run a restaurant by himself anyway? What is with the flowerpot I am assuming it is Sunbae because he is angry that Woo-Hyun is treating her so terribly when she gave up being an angel for him. Or it could be the guy from the angel human committee? trying to help the situation! The preview for next week sure looks entertaining and the boys are going to get closer! In the beginning of the 8th episode Seul-Bi decides to go back being an angel and her Sunbae shows up and tells her that she has 7 days before she goes back to being an angel. At school the girl from the cafe asks Seul-Bi about the 29th and if she saw Ye-Na then because she came to her cafe on the same day. In class Seul-Bi apologizes to everyone for making their lives harder and everyone is shocked. Woo-Hyun is at school and is writing a letter of apology in a room by himself. Seul-Bi goes to the room and finds Ye-Na there and she wants to return Woo-Hyun the money he gave her before. Seul-Bi tells her that she should ask Woo-Hyun what he wants and gives her advice, and she gives Seul-Bi the money to give to him. Jae-Suk is with his gang and Chun-Shik and they want to keep beating him up and Seul-Bi comes and tries to stop them and she tries to use her powers and Jae-Suk tell her that she can act cute sometimes and goes to touch her head and Sung-Yeol pushes his hand away. The girl from the cafe and Suk-Hoon blow whistles around the corner and Jae-Suk and his gang get scared and run away. Seul-Bi and Sung-Yeol talk later and she says she owes him and tells him if he wants anything or to do something that he should tell her. The girl from the cafe talks to the teacher and explains the situation about Ye-Na planning the whole thief situation and that Jae-Suk bullies Chun-Shik and he tells her he did not know of all this. Seul-Bi and Sung-Yeol both are going to give Woo-Hyun their notes and he finds them together and they squabble a bit and then they go back to class. Jae-Suk goes to Woo-Hyun room and they get mad at each other and Woo-Hyun grabs his collar and the gym teacher catches them and sends Jae-Suk away. The gym teacher reads the letter of apology and is says that Seul-Bi did not steal it and he doesn’t believe Woo-Hyun. Mrs.Ahn and Grandmother get together and she asks Mrs. Ahn to look out for Woo-Hyun and that he doesn’t have to live with her. Grandmother tells her that if she doesn’t do it she is going to tell her husband and son and that even if she gets divorced she could live with Woo-Hyun then. Mrs. Ahn gets mad and says that even when she was with Woo-Hyun as a baby he only looked for Grandmother and she told her to leave because Grandmother wold take good care of Woo-Hyun and tells her not to see her again. Woo-Hyun and Seul-Bi go out for supper and they talk about him giving Ye-Na money and her apologizing and he tells her will reveal the truth for her. He complains of his arm hurting from writing the letter and she massages it for him. They then go shopping together and he suggests a couple tee and they like them and Seul-Bi suggests they get one for Grandmother. They go home and eat with Grandmother and she tells Woo-Hyun that she is selling the store because she wants to go on vacation and he likes that idea so she can rest more. She shows Woo-Hyun all the money that he needs for the future. The homeroom teacher and gym teacher go out for drinks and the homeroom teacher is upset that he didn’t know about what was happening with his students and the gym teacher tells him that he was just seeing what he wanted to see and he thought he knew. Grandmother is getting rid of her clothes and Woo-Hyun gives her a hard time because of it and thinks something suspicious is going on and hugs her and tells her she needs to live long and she gets tears in her eyes. Grandmother gives Seul-Bi all her recipes so in case she forgets she has them and that the secret is thinking about the person she is cooking for. The three of them wear their couple tees and go on a picnic together. At the picnic Seul-Bi and Woo-Hyun are chasing each other and Grandmother starts having more pain and calls out to them and the ambulance comes and they go to the hospital. The doctor tells them that Grandmother is in the last stage of her cancer and is beyond treatment and that he should get ready for her death. They go see Grandmother and Woo-Hyun is crying and asking why she didn’t tell him. Grandmother wakes up and tells him that she didn’t want to break his heart by telling him. She tells him to go get her bag from home and Seul-Bi stays with her and she tells her to always smile for him. While Woo-Hyun is at home he gets a call and goes running to the hospital. When he gets there Grandmother has flatlined and died. Seul-Bi sees Sunbae taking Grandmother and asks him to give her more time. Grandmother then realizes that Seul-Bi is an angel. Seul-Bi then says that if she knew how much it hurts for someone to die that she would have been kinder when taking a dead person and would have given them time to say goodbye and told them about those left behind. Sunbae tells grandmother it is time to go. Woo-Hyun catches Seul-Bi talking about leaving and she tells him she has to go back and he thinks her memory has come back and that it is soon and he tells her to go now instead. The funeral happens and Sung-Yeol comes and sits with Woo-Hyun. Some of Jae-Suk’s gang members come to the funeral and Suk-Hoon at first won’t let them in but one of them says that it takes a real man to come to funerals. Mrs. Ahn is there and finds her husband because Sung-Yeol phoned him. An older lady recognizes Mrs. Ahn as Woo-Hyun’s mother in front of her husband and she tells her she got the wrong person. Sung-Yeol gets a phone call from his real mother and she tells him that she is getting married and he gets upset and wants to know why everyone is only concerned about their happiness and not his and Mrs. Ahn overhears the conversation. Mrs. Ahn tries to comfort him later and tells him adults are bad and they don’t leave because they don’t like him but that they think he will understand. Sung-Yeol’s dad talks about helping Woo-Hyun and finding his mother and Mrs. Ahn jumps in against that idea. Woo-Hyun is at the funeral with Sung-Yeol and is upset that he didn’t realize that she was sick and is blaming himself and Grandmother and Sunbae are there watching them and is feeling bad for him. Seul-Bi’s book tells her it is the last day and she gives Sung-Yeol a cd and tells him that she is leaving and he is upset that everyone is leaving him and when they shake hands he pulls her into a hug. Seul-Bi tells Woo-Hyun that she is leaving he tells her to go. Sunbae, Grandmother and Seul-Bi all watch Woo-Hyun sit outside and Grandmother tells her to take care of Woo-Hyun and hit him hard so he can cry easier. Sunbae takes Grandmother away and when Seul-Bi goes to talk to Woo-Hyun Sunbae stops her and tells her quick goodbyes are better and she decides to leave with him. Wow what a sad episode! I definitely shed some tears throughout this episode! I recently found out that Seul-Bi (Kim Sae-Ron) is only 14 years old! Wow her acting is awesome and I didn’t even know she was that young and I am sure a lot of the actors around her are a lot older and she is able to carry the drama as a lead!! I am highly impressed! Did anyone else realize how young she was? It was hard to have to wait an extra week for this episode!! Why is it only this series that seems to keep being bumped!? It really seems like Mrs. Ahn’s husband has realized that she is Woo-Hyun’s mother and he wants to help the situation but she is so shut off and doesn’t want to tell him which is silly because he seems like the most understanding and empathetic man in this drama!! I would love to see them all living as a family that would be awesome! I mean Woo-Hyun can’t just live by himself now! It is so sweet that Sung-Yeol is taking care of Woo-Hyun and supporting him! I mean we are halfway through the drama and she is going back to being an angel already! or is she? I mean that seems to early for her to go back and stay as an angel for the rest of the drama so she must go back to being human after an episode or 2 or she is going to change her mind and not go back with Sunbae yet? I am not sure but it definitely is a fun drama well I guess this episode wasn’t that fun? more depressing!